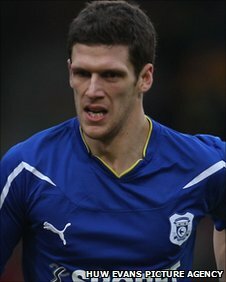 Cardiff City will be without defender Mark Hudson for up to six weeks after he limped off with a knee injury during Saturday's 3-3 draw at Millwall. Scan results revealed that Hudson suffered a Grade Two tear of his knee ligaments and he has been ruled out for between four to six weeks. But Jay Bothroyd and Paul Quinn expected to return for the Bluebirds after the international break. Bothroyd and Quinn were both forced off with injuries during the Millwall game. England striker Bothroyd suffered a hamstring injury during the first half of the game at The Den, but the injury is not as bad as first feared and he is set to return within two weeks. Full-back Quinn was substituted during the second half after suffering a muscle strain but is also expected to be fit for home match against Derby County on 2 April.